Where do I begin… The Bentley Continental GT was a real opinion divider when it was launched in 2003. A lot of people were not too keen on the styling and the message it gave, but the nouveau-riche and professional footballers were in a frenzy over its positively modern look compared to the existing models. The biggest dividing point was the VW influence though: The classic 6¾ litre Bentley V8 had been replaced by a twin-turbocharged version of VW’s 6 litre W12 engine from the rather pedestrian Phaeton. Personally, I liked it. I liked the way it looked, I liked the 550bhp and I liked the fact that unlike pretty much all Bentleys of old, this one might actually be a reliable option for people who would otherwise look at the more sterile and less interesting German options when it came to a big luxury GT car – Not that there was much to choose from! Fast forward 10 years, and I am finally holding the key to one. 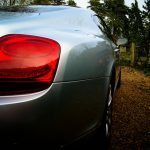 Now, this wasn’t technically my first time driving a Bentley with this powertrain in – I had a quick blast in a Flying Spur a few years prior to this, but not for long enough to really get a feel for it. The car in question was nearly 10 years old, with around 40,000 miles on its odometer and, I am not going to lie, you could start to tell inside. The outside still looked as fresh as it did the day it rolled out of Crewe, but the infotainment system was starting to look very dated compared to similar cars of its class, and the leather hadn’t held out that well either. In my CL500, a year older and with nearly twice the miles on the clock, the perforated leather seats still looked like new, whereas the Continental’s had already started to show that shine that comes from thousands of hours of bottom shuffling over the years. In all fairness though, it was still a beautiful car and wonderful to be inside. 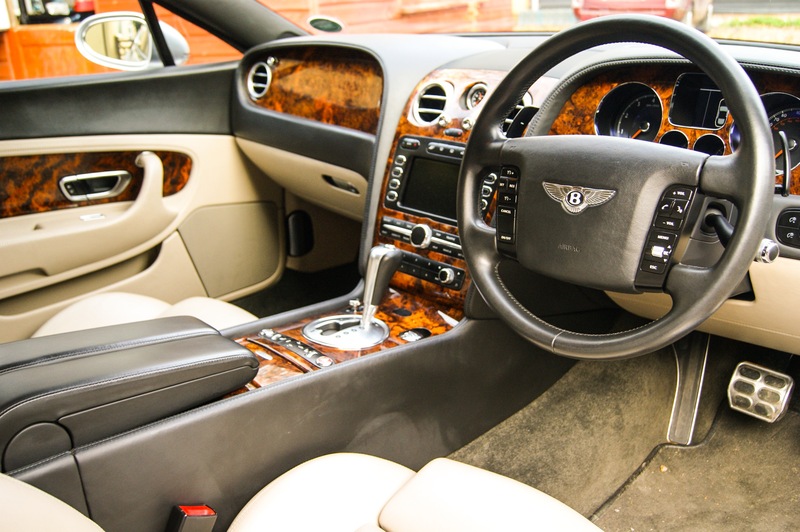 With big, comfy, cream leather armchairs surrounded by a blue and cream stitched leather cockpit, those famous Bentley veneers, and the Breitling clock in the centre console, from the second you sat down you knew you were in a Bentley. 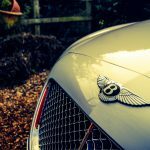 Driving the Bentley around town and on short runs to the shops and back were characteristically pleasant. Being roughly the same dimensions as my Mercedes, it didn’t feel oversized or difficult to manoeuvre around buses and the like, the steering was nice and light at low speeds and, of course, it was beautifully quiet inside. I also found it surprisingly easy to park, although that may be because I am used to parking big 4x4s like the L322 Range Rover and other big barges. 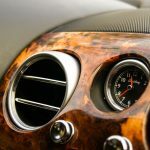 This is all very well, and expected of a car with such a luxury and prestigious heritage, but what is it like when you finally get out and open the taps? To put it simply, fantastic. There are a lot of things wrong with how it drives, like the fact that it weighs about the same as my Discovery, and the handling isn’t to dissimilar either, but I really don’t care. One thing I know is that 550bhp plus big comfy seats equals a very happy James. When you plant that right foot down, it just goes. It accelerates in a way a car this heavy really shouldn’t and it sounds like thunder. There are a lot of cars out there with big engines that make a lot of noise when you pin them, but it’s often a very nondescript sound. 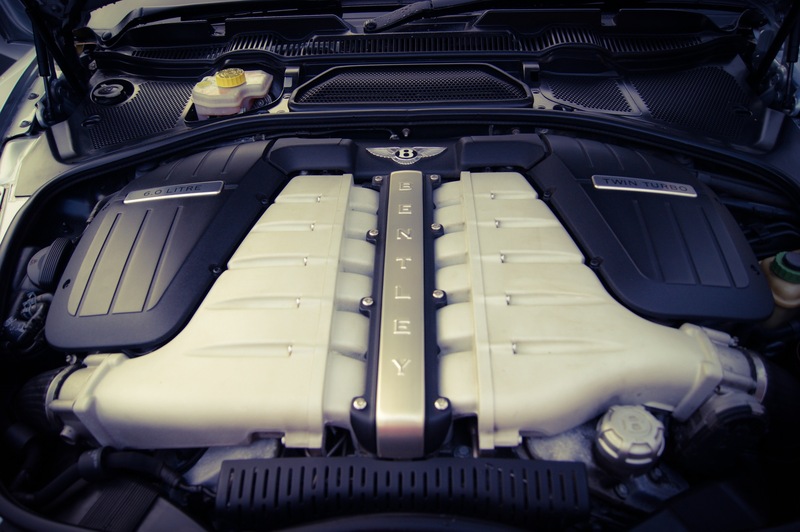 Some cars make a sound that lets you identify them from a mile off, such as the Porsche Flat 6 engine, the Ferrari N/A V8 and the Aston V8 in the Vantage. 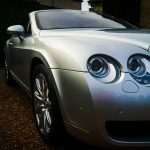 In my opinion, the Bentley is another of these: It has a unique deep bellow that just feels very British, and I can’t really explain why. It’s like being at Twickenham for a sold-out England game – It’s an incredibly unique sound that just makes you feel all warm and patriotic. It also eats up the tarmac, and you feel as though if you left your foot where it on the accelerator, the needle would just keep going on and on and on. It gathers speed at such a rate but you just don’t really feel it. Obviously there is a bit of road noise from the awful run-flat tyres, and that exhaust note is also there humming in your ear, but you feel more like you’re on a cruise ship than a speed boat. The stoppers are good too, and they bring this yacht to a standstill in very reasonable time. For the money and everything else, there are better choices out there, both in the used and new car games, but in my free time I like to plan road trips, and if time and money allows, go on them as well. I have driven over to the continent a few times and loved it, but now whenever I plan them, I always plan them with the GT in mind. To me it is the perfect long road trip car. I know that I could load a suitcase in the boot, fill up the tank and drive all the way to Monaco (via a few petrol stations) and get out without so much as the need to stretch. The only car I would chose over the GT coupe for a drive like this is the GTC – I am not normally one to go for a droptop over a coupe, but when you’re driving along the Riviera in that 30-degree sunshine, you want the top down. A lot has changed in the Continental range since 2004, including the introduction of a new (and dare I say better) V8, and a lot of work has been done to modernise the interior and accompanying gadgets, but it still looks a few steps behind some of its competitors like the S63 AMG Coupe. It will always have that one trump card up its sleeve however, that name: Bentley.